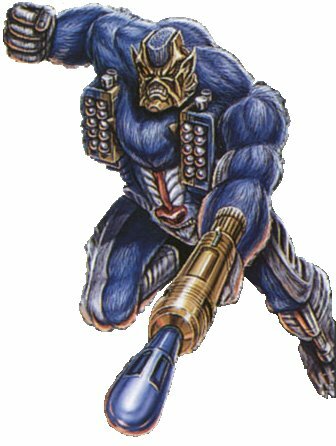 A guerrilla warfare tactical expert, B'Boom is one of the fiercest and most unpredictable of the Maximals. Though hard to control and often driven by a temporary fury that sends him speeding up and down the trees, his focus while in battle is easily apparent by the savage fire in his eyes. Dexterous, brave and clever, B'Boom is fiercest while in mega artillery attack mode, a state in which his arsenal is as fully loaded and functional as a battle emplacement. His favorite weapon, a launcher hidden within his mouth, deploys pulse missiles that detonate but do not burn-leaving his best weapon, the wilderness, unharmed.